For Spacious Skies: The Uncommon Journey of a Mercury Astronaut, ISBN 0-15-100467-6 or the revised paperback edition ISBN 0-451-21105-7, Carpenter's biography, co-written with his daughter Kris Stoever; describes his childhood, his experiences as a naval aviator, a Mercury astronaut, including an account of what went wrong, and right, on the flight of Aurora 7. Into That Silent Sea: Trailblazers of the Space Era, 1961–1965, by Francis French and Colin Burgess, 2007. A Carpenter-approved account of his life and space flight. The Steel Albatross, ISBN 978-0831776084. Science Fiction. A 'technothriller' set around the life of a fighter pilot in the US Navy's Top Gun school. Deep Flight, ISBN 978-0671759032. Science Fiction. This follow-on to The Steel Albatross is an underwater outburst of war and action. ^ Dana Ford. Mercury Seven astronaut Scott Carpenter dies at 88. CNN. 2013-10-10 [2013-10-11] （英语）. ^ Tara Gray. 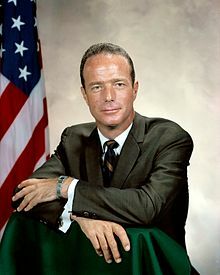 Scott Carpenter biography; "40th Anniversary of the Mercury 7" NASA.gov. Retrieved January 9, 2010. ^ Scott Carpenter Fast Facts. CNN NewSource. [October 10, 2013]. （原始内容存档于2013年10月12日）. ^ Robert Z. Pearlman. Scott Carpenter, astronaut-aquanaut, dies, was second American in orbit. collectSPACE.com. October 10, 2013 [October 10, 2013].